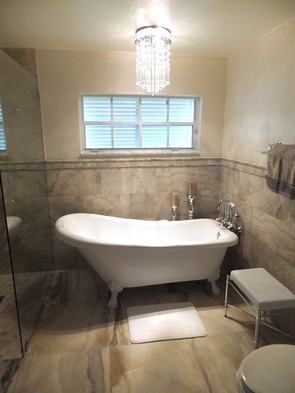 Since we are a Tile Contractor in Florida we know the importance of ways to protect your new tile investment from cracking due to minor Florida slab cracks or in plane horizontal movement. 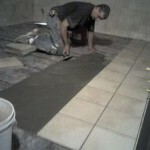 We have been witness to many beautiful tile jobs that were installed wrong and failed from small cracks, delaminating or even tenting of the tile. One of the product we use in Florida for these problems is National Applied Construction (NAC) Products. 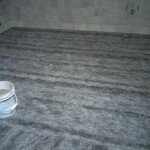 Our company offers many different types of quality crack & waterproofing membranes to fit your project and your budget. 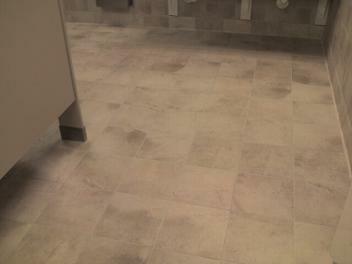 If you are interested in a tile job that is water & crack proof Contact Us. ECB MEMBRANE is a self-bonding, sheet applied elastomeric membrane. 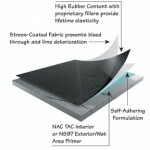 It consists of a base layer of polymer modified elastomers, permanently laminated to a unique “stress flex” fiber sheet. Together they form a single 40 mil (1/16″) high strength self-bonding membrane that is easily applied. 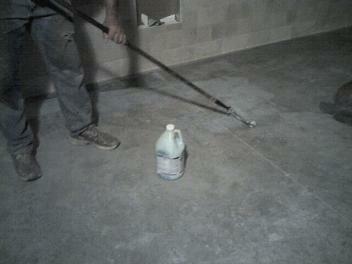 ECB MEMBRANE is designed for use under floor tile surfaces that require protection from structural movement. 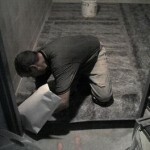 ECB MEMBRANE adheres permanently to the sub-floor, remains flexible and will last the life of the flooring surface. 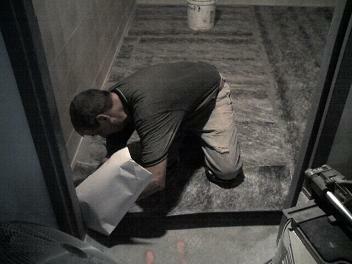 ECB MEMBRANE bridges all existing and future movement of the sub-floor. The key to ECB’s effectiveness is its two component patent pending design. 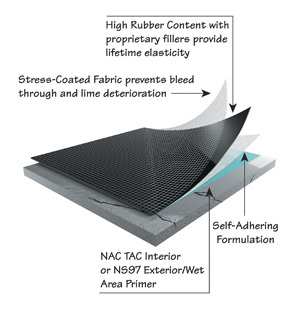 The elastomeric base layer functions as a buffer, absorbing the thermal and structural movement of the sub-floor, while its unique “stress flex” fiber sheet creates a new flooring surface which will accommodate most mortars, organic adhesives and epoxy setting materials. ECB MEMBRANE protects tile from structural movement, live and dead loads (bounce and reverberation), movement of cracks and shrinkage (creep). 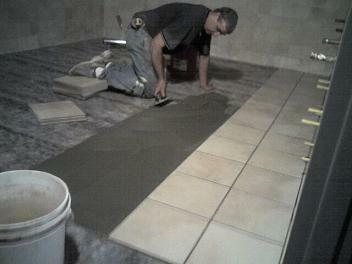 The adhesion and integrity of the tile floor are preserved by the “anti-fracture” action of ECB MEMBRANE. ECB MEMBRANE is cost effective as a sub-floor over wood, concrete, terrazzo, pre-cast panels, light weight concrete, radiant heated floors, vinyl composition and vinyl asbestos tile, metal and other existing hard surface flooring, providing they are structurally sound. 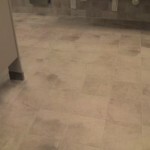 ECB MEMBRANE can be used in malls, airports, commercial buildings, department stores, office buildings, restaurants, apartments, condominiums, residential homes or anywhere sub-floor problems threaten the integrity of the tile floor. Because ECB MEMBRANE is only 40 mil thick (1/16″), it can be used in new or remodel construction where height restrictions exist; mud beds, concrete backer boards, plywood, and other sub-floor systems cannot. 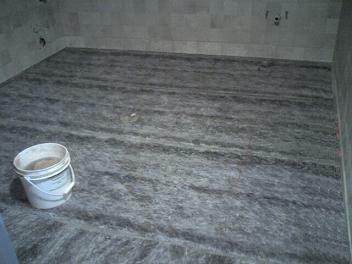 ECB MEMBRANE is also an insulator, helping floors stay warmer, drier and quieter. 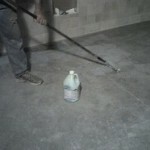 ECB MEMBRANE is recommended for thin-bed installation of ceramic tile, quarry tile, marble, pavers, stone, agglomerate tile, and commercial grade vinyl composition tile and is an effective vapor barrier under wood and carpet.